It's important to be prepared to face the elements when you go ice fishing by including these items: shelter and apparel. Ice fishing can be a fairly cold activity, especially on those windy days when it doesn’t seem fit to be outdoors. On such days, an ice shanty is almost a requirement. Many portable shanties are available at your local sporting goods store, although some anglers, especially in northern Michigan where the ice fishing season can last for many months build elaborate but removable shanties on the ice. These may have insulated walls and many of the comforts of home. Propane heaters can keep them warm and help keep the fishing holes from freezing. But even a simple windbreak, made of plywood or particle board, can help. A sheet of plywood, cut in half and hinged, makes a simple windbreak. If skis or runners are added to one side, then it can easily be pulled across the ice. 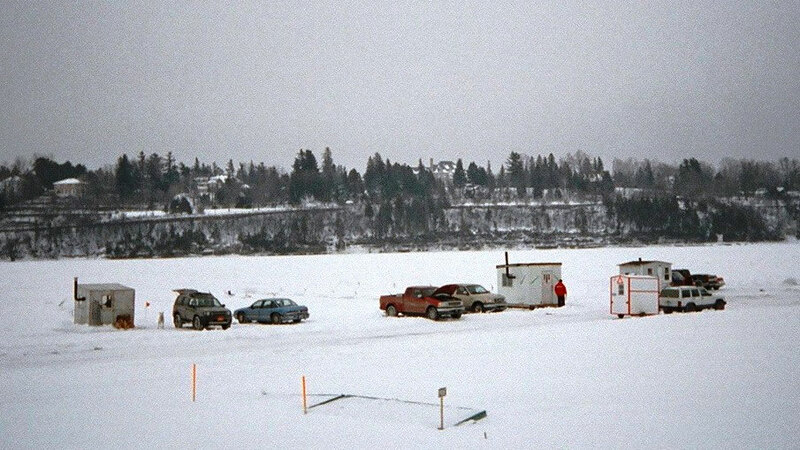 It’s important to note that all shanties must be removed from the ice by a certain date, 4appropriate to the zone in which you are fishing. When removing a shanty, anglers must also remove any and all garbage affiliated with the structure, including plywood and propane tanks.